The Settings sample application demonstrates how to create a complicated and multilevel user interface for a Tizen Web application. The application is not fully functional: its code covers only the presentation layer, and the actual setting management is not implemented. 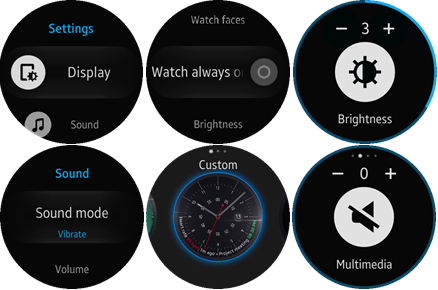 The TAU (Tizen Advanced UI) library components are used to speed up the development process. The following figure illustrates some of the screens of the Settings application. The application's features are grouped thematically into several multilevel views. The main view shows the top level groups. To go to the deeper level, tap the applicable list row. If the feature supports additional settings, the new view opens. 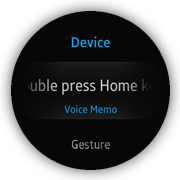 To go back to an upper level, use the flick down gesture or the device Back key. Some of the views use the swipe left and right gestures to navigate between their subviews. In such cases, the page indicator component is shown at the top of the screen (for example, see the volume view at bottom right in the above figure). The application uses a simple MV (Model View) architecture, which contains the core part determining the architecture and the application part determining the application behavior. The core.js file implements a simple AMD (Asynchronous Module Definition) and specifies module defining. css/tau-custom.css This file contains the custom CSS styling for the TAU components. images/ This directory contains all the images used in the application. js/core/ This directory contains the core modules used in other parts of the application code. js/helpers/ This directory contains the helper functions for lists and DOM manipulation. js/views/ This directory contains code handling UI events for all pages. lib/tau This directory contains TAU library files. The Settings sample consists of many views (pages), and this topic describes an example of each view type and how various components are used to build the application pages. Other views are created similarly. The main page uses this solution. The vibration, sound, gesture, date and time, Bluetooth, Wi-Fi, NFC, accessibility, vision, and hearing pages use this solution. The display, call, call forwarding, mobile networks, and Gear info pages use this solution. The mobile networks page uses this solution. 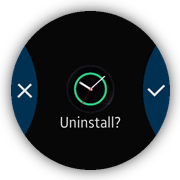 The watch faces page uses this solution. The call forwarding page uses this solution. The set date and set time pages use this solution. The brightness and volume pages use this solution. 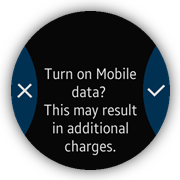 The display, device, gesture, network operators, hearing, and Gear info pages use this solution. The sound mode, font style, font size, double press home key, and network mode pages use this solution. The main page shows how to use a list with thumbnails and scroll animation. The main page displays a list of settings groups. Some extra CSS code is required for thumbnail images. Mask images are used for this purpose. All images are located in the images folder in the root of the application. The views/main module loads all of its subview modules. The module also uses a list helper to add a scale animation effect while the page is being scrolled (listHelper.animate()). The list helper is used in all views containing lists. The list helper provides the animate() method, which adds a scroll animation effect (scale) to a specified page (as a parameter). The module adds listeners for the pagebeforeshow and pagebeforehide events. Before the page opens, it creates a tau.helper.SnapListStyle instance with the scale animation. The instance is destroyed when the page is hidden. The animation is used by all of the list-based pages and is added immediately if a specified page is already active. The vibration page is one of the views that shows a list with animated subtext elements and toggle switches without a confirmation popup. It displays a list of settings for the device vibration. The user can change the state of the toggle switch without any additional popup confirmation. The layout consists of a header displaying the page name and a list displaying the settings. TAU subtext elements and toggle switches are used. Some extra CSS code is required for subtext element animation. The opacity transition is used to create a smooth fade in and fade out effect. The views/vibration module loads a sub-view module, a list helper module responsible for the scroll animation effect, and a page helper module responsible for resetting the page scroll position. It also updates the UI with the current setting values (vibration intensity), when the page is being shown (in the pagebeforeshow event). The page helper provides the resetScroll() method, which allows the application to make a decision on whether the page scroll must be reset. The best moment for the resetScroll() method call is the pagebeforeshow event listened for by the page element. According to the logic of this module, the page scroll is reset always, except the situation when the page is displayed after a history back action. This core functionality is based on the popstate event listened for by the window element, the pageshow event listened for by the document element, and the historyBack variable, whose value decides whether the page scroll is reset. This module is used in a similar way by many of the application page modules. The call page shows how to use a list with text elements and toggle switches, and a confirmation popup that is displayed when the toggle state is to be changed from off to on. 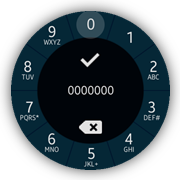 This page displays a list of device call settings. The Voice control list element uses a text element, toggle switch, and an additional popup. The user must confirm the switch on action by tapping the OK button in the displayed popup. The switch off action requires no confirmation. Say "Answer" or "Reject" between vibrations. <a id="voice-control-popup-ok-btn" href="#" class="ui-btn btn-apply"
The views/call module loads a subview module and all the necessary helper modules, including popup, which is responsible for resetting the popup scroll position. To prevent the user from changing the voice control switch state from off to on without confirmation action, the application supports the <div class="ui-li-cover"></div> element (layer) that covers the clickable label of the Voice control list element. To make decision on whether the confirmation popup must be displayed, the application listens for the click event on the Voice control list element. When the event occurs, the application checks the toggle switch state. If the state is off, the confirmation popup is opened, otherwise the click() method of the toggle switch component is called in order to change its state without confirmation. The popup helper provides the resetScrollBeforeOpen() method, which allows the application to reset the popup scroll every time it is opened. The best moment for the resetScrollBeforeOpen() method call is the init() method of the page that uses the popup. This method takes 2 parameters, the reference to the popup element and an optional scroll position value, to which the popup scroll must be reset. The popup helper defines a handler that is called when the popupbeforeshow event of a given popup element occurs. In such a situation, the popup scroll is reset. The mobile networks page shows how to use a list with text elements and toggle switches, with a confirmation popup that is displayed when the toggle state is changed. This page displays a list of device mobile network settings. The Mobile data list element uses a text element, toggle switch, and an additional popup. The user must confirm both switch on and switch off actions by tapping the OK button in the displayed popup. This may result in additional charges. Some extra CSS code is required for the toggle switch element and popup layout. The example snippet is shown in the previous section. The views/mobileNetworks module loads all necessary subviews and helper modules. To prevent the user from changing the mobile data switch without confirmation action, the application supports the <div class="ui-li-cover"></div> element (layer) that covers the clickable label of the Mobile data list element. To make a decision on which popup must be displayed, the application listens for the click event on the Mobile data list element. When the event occurs, the application checks the toggle switch state. Depending on the value of the state, the application opens the proper confirmation popup (mobileDataSwitchOnPopup or mobileDataSwitchOffPopup). When the user clicks the OK button in the displayed popup, the click() method of the toggle switch component is called in order to change the toggle switch state after confirmation. 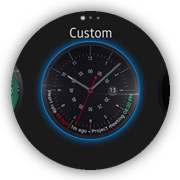 The watch faces page shows how to use the section changer TAU component together with the page indicator TAU component on the same page. 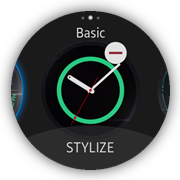 This page provides a UI that allows the user to manage the appearance of the watch faces. The user can set up the active face, or uninstall a selected face. Additionally, the application allows the user to stylize the selected faces. To show the list of available faces, the application uses the section changer component. It allows the user to navigate between different sections of the same page using the swipe left and right gestures. To make the navigation more intuitive, the application uses the page indicator component, which indicates the position of the currently displayed face on the section face list. The views/faces module loads all necessary subviews and helper modules. The initializeCirclePageIndicator() method is responsible for the page indicator and section changer component initialization. It is called when the page is being shown and during the views/faces module initialization. When the page is being hidden, the application calls the destroyCirclePageIndicator() method, which destroys the previously used TAU components. The sectionchange event occurs after a swipe left or right user action performed on the section content. When it happens, the application updates the page indicator using the setActive() method of the page indicator component. At the same time, the section name and footer visibility are updated. The click event occurs after a click user action performed on the section content. When it happens, the application checks which part of the section content is clicked. If it is the remove icon, the remove popup is displayed. Otherwise, the application displays the face change processing progress element and, after 2 seconds, the application is closed. 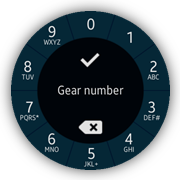 The call forwarding page shows the number selector screen that allows the user to select numbers. All these elements are positioned absolutely. The layout of this page contains a set on buttons placed around the display. The user input preview and control buttons are placed in the middle of the screen. To show dividers between alphanumeric buttons, the canvas element is used. The active class is added for the element when a tap event is detected. This class applies an additional rule. The class change causes an animation start. This is a simple animation of opacity and scale values. When a tap event is detected, the method checks its distance to the center of the display. If the distance is bigger than a set value, the pressed segment index is calculated by the getSegment() method and the user input string is updated with the computed value. In addition, the tap indicator is shown. The addToInput() method adds one char to a string. This method is invoked when the user taps an alphanumeric button. The onDeleteInput() method removes the last char from a string. This method is invoked when the user taps the delete button. The Set date popup is shows how to use rotary events, which improve user interaction on a wearable rotary device. The view allows the user to select and change the current system date. The popup is composed of a title header (Set date), current date value divided into 3 labeled parts (month, day and year), confirm button (SET) and a clock face with one hand (additional presentation of the current value). Each part of the date can be selected by making it active. 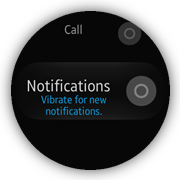 The active part value can be changed by rotating the bezel of a device. 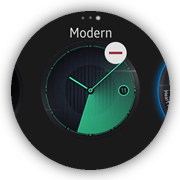 The value change is also reflected by the change of the clock hand position (with smooth animation). The final date change confirmation is done by clicking SET in the footer. The module sets a listener for the rotarydetent event. When the bezel rotation is captured, the onRotaryDetent() method is called. The value is used to decide whether a selected part of the date (month, day, or year) must be incremented or decremented. Further processing is done by the setCurrectDatePartRelative() method. The setCurrentDatePartRelative() method updates a specified part of the date by a specified value. It also does some calculations to make sure the final date is valid (dateHelper is used). Finally, it changes the currentDate variable and fires an event to allow other parts of the module to update their state. The event is captured and the onCurrentDateChanged() method is used as a callback. It calls 2 methods, which update the user interface. The first one (updateDate()) updates the date elements, and the second one (updateHand()) calculates and updates the clock hand angle. Finally, the hand.angle.changed event is fired. The onHandAngleChanged() method updates the user interface using the CSS rotate transformation. 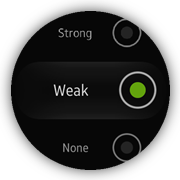 The brightness page shows how to use the slider TAU component. This page provides a UI that allows the user to manage the device brightness value. 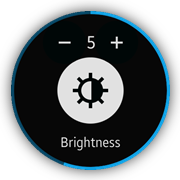 The user is able to change the brightness value by using the + and - buttons or by rotating the bezel of the device. 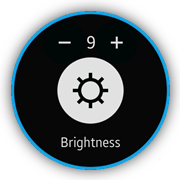 The current brightness value is indicated by a displayed number (in the range from 0 to 9) as well as by the icon, whose appearance changes along with the change in the brightness value. The layout consists of the header, content, and footer elements. The header contains the + and - control buttons as well as the number indicator that shows the current brightness value. 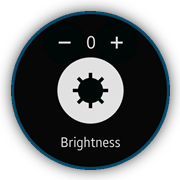 The content element defines the brightness icon indicator and the slider component that allows the user to change the brightness by rotating the bezel of the device. The footer displays static text that indicates what type of value is changed. <input id="circle" data-type="circle" name="circleSlider" type="range"
The views/brightness module does not load any additional subviews or helper modules. The slider TAU component is initialized every time the brightness page is shown. Its default value is used by the updateBrightnessValue() and updateBrightnessIcon() methods to set up the initial values of the brightness indicators. At the same time, the application defines the onCircleSliderChange() method, which is called every time the value of the slider component changes. The application also provides support for the click event handling on the + and - control buttons. For this reason, it defines the onBrightnessMinusClick() and onBrightnessPlusClick() methods. Depending on which of them is invoked, the application calls the decreaseBrightness() or increaseBrightness() methods. Each of them calculates the proper brightness value and finally calls the value() method of the slider component in order to set up its value. The device page shows how to use the marquee TAU component. It displays a typical list of application options. It also contains a Double press Home key option. Because the length of the title of this option is longer than the width of the device, it is a good opportunity to use the marquee component. The marquee component provides an animation effect that changes the position of the text, from right to left, to show all of the text characters. The layout consists of a header and a list, which displays the settings. The text that uses the marquee animation effect is wrapped by a <div> element with the ui-marquee and ui-marquee-gradient CSS classes. The views/device module loads all necessary subviews and helper modules. From the marquee TAU component point of view, the most important is the helpers/list module. It defines the marquee() method that is responsible for the described animation effect. The best moment for the marquee() method call is the module initialization. The list helper provides the marquee() method that is responsible for the marquee TAU component initialization and its behavior management. This method takes the HTMLElement list as a parameter. When the selected event occurs, the marquee component is initialized and its start method is called. When the scrollstart event occurs, the application stops the marquee animation, if it is active, and the position of the animated text is reset. When the scrollend event occurs, the application clears the reference to the marquee component. This reference is also cleared on the pagebeforehide event, which is also provided by the list helper. The sound mode page shows how radio buttons are used to obtain the user choice and immediately return to the parent page. The value is stored and the previous page is shown when the closest element is detected.